"Base e" redirects here. For the numbering system which uses "e" as its base, see Non-integer representation § Base e.
Graph of the natural logarithm function. 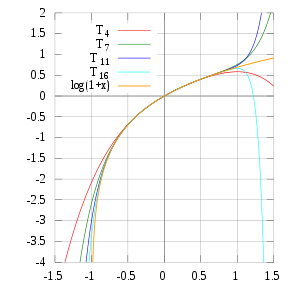 The function slowly grows to positive infinity as x increases and slowly goes to negative infinity as x approaches 0 ("slowly" as compared to any power law of x); the y-axis is an asymptote. The natural logarithm of a number is its logarithm to the base of the mathematical constant e, where e is an irrational and transcendental number approximately equal to 7000271828182845899♠2.718281828459. The natural logarithm of x is generally written as ln x, loge x, or sometimes, if the base e is implicit, simply log x. Parentheses are sometimes added for clarity, giving ln(x), loge(x) or log(x). This is done in particular when the argument to the logarithm is not a single symbol, to prevent ambiguity. The natural logarithm of x is the power to which e would have to be raised to equal x. For example, ln(7.5) is 2.0149..., because e2.0149... = 7.5. The natural log of e itself, ln(e), is 1, because e1 = e, while the natural logarithm of 1, ln(1), is 0, since e0 = 1. The natural logarithm can be defined for any positive real number a as the area under the curve y = 1/x from 1 to a (the area being taken as negative when a < 1). The simplicity of this definition, which is matched in many other formulas involving the natural logarithm, leads to the term "natural". The definition of the natural logarithm can be extended to give logarithm values for negative numbers and for all non-zero complex numbers, although this leads to a multi-valued function: see Complex logarithm. Logarithms can be defined to any positive base other than 1, not only e. However, logarithms in other bases differ only by a constant multiplier from the natural logarithm, and are usually defined in terms of the latter. For instance, the binary logarithm is the natural logarithm divided by ln(2), the natural logarithm of 2. Logarithms are useful for solving equations in which the unknown appears as the exponent of some other quantity. For example, logarithms are used to solve for the half-life, decay constant, or unknown time in exponential decay problems. They are important in many branches of mathematics and the sciences and are used in finance to solve problems involving compound interest. By Lindemann–Weierstrass theorem, the natural logarithm of any positive algebraic number other than 1 is a transcendental number. The concept of the natural logarithm was worked out by Gregoire de Saint-Vincent and Alphonse Antonio de Sarasa before 1649. Their work involved quadrature of the hyperbola xy = 1 by determination of the area of hyperbolic sectors. Their solution generated the requisite "hyperbolic logarithm" function having properties now associated with the natural logarithm. An early mention of the natural logarithm was by Nicholas Mercator in his work Logarithmotechnia published in 1668, although the mathematics teacher John Speidell had already in 1619 compiled a table of what in fact were effectively natural logarithms. The notations "ln x" and "loge x" both refer unambiguously to the natural logarithm of x. "log x" without an explicit base may also refer to the natural logarithm. This usage is common in mathematics and some scientific contexts as well as in many programming languages. [nb 1] In some other contexts, however, "log x" can be used to denote the common (base 10) logarithm. Historically, the notations "l." and "l" were in use at least since the 1730s, and until at least the 1840s, then "log." or "log", at least since the 1790s. Finally, in the twentieth century, the notations "Log" and "logh" are attested. One unit of area characterizes Euler's number. Add and subtract triangles of area one-half for a hyperbolic sector. 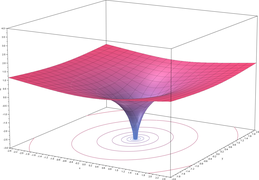 for n ∈ ℤ produces a bi-infinite sequence of hyperbolic points. When two adjacent points are joined to (0, 0) by hyperbolic radii, the hyperbolic sector so formed has unit area. Thus the total area inside the hyperbola and its asymptotes is infinite, consistent with divergence of the harmonic series. Area measure accords with the arc measure in both the circle and right hyperbola: in a circle of radius √2, the arc of a circular sector has an angle equal to the sector area. Likewise, the hyperbolic angle of a hyperbolic arc is measured by the area of the corresponding hyperbolic sector of xy = 1. Tribute is paid to Leonhard Euler who profiled the importance of Euler's number e = 2.71828... as the base of the exponential function and natural logarithm. He introduced the idea of a transcendental function to classify the trigonometric and exponential functions in the precalculus textbook Introduction to the Analysis of the Infinite (1748). The quadrature of the hyperbola requires the natural logarithm, so integral calculus was inhibited by the lack of an expression for hyperbolic quadrature until Gregoire de Saint-Vincent (1647) described it with a logarithmic feature: the correspondence of an arithmetic sequence of areas with a geometric sequence on the asymptote. Expositions by Nicholas Mercator, Christiaan Huygens and others led to Euler's Introduction that detailed the circular functions in terms of infinite series. 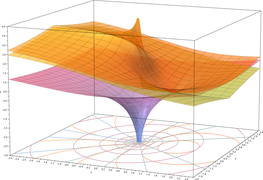 The connection between area and the arcs of circular and hyperbolic functions demonstrates the naturalness of this logarithm. ln(a) illustrated as the area under the curve f(x) = 1/x from 1 to a. If a is less than 1, the area from a to 1 is counted as negative. The area under the hyperbola satisfies the logarithm rule. Here A(s,t) denotes the area under the hyperbola between s and t.
In elementary terms, this is simply scaling by 1/a in the horizontal direction and by a in the vertical direction. Area does not change under this transformation, but the region between a and ab is reconfigured. Because the function a/(ax) is equal to the function 1/x, the resulting area is precisely ln(b). The number e is defined as the unique real number a such that ln(a) = 1. Alternatively, if the exponential function has been defined first, say by using an infinite series, the natural logarithm may be defined as its inverse function, i.e., ln is that function such that exp(ln(x)) = x. Since the range of the exponential function on real arguments is all positive real numbers and since the exponential function is strictly increasing, this is well-defined for all positive x.
. This completes the proof. then the derivative immediately follows from the first part of the fundamental theorem of calculus. If the natural logarithm is defined as the inverse of the (natural) exponential function, then the derivative for x > 0 can be found by using the properties of the logarithm and a definition of the exponential function. 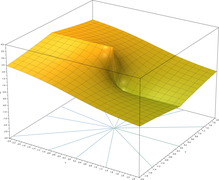 The Taylor polynomials for ln(1 + x) only provide accurate approximations in the range −1 < x ≤ 1. Note that, beyond some x > 1, the Taylor polynomials of higher degree are increasingly worse approximations. valid for |x| ≤ 1 and x ≠ −1. , nevertheless applied this series to x = −1, in order to show that the harmonic series equals the (natural) logarithm of 1/(1 − 1), that is the logarithm of infinity. Nowadays, more formally, one can prove that the harmonic series truncated at N is close to the logarithm of N, when N is large. 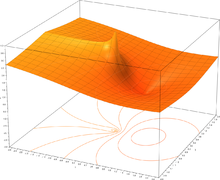 At right is a picture of ln(1 + x) and some of its Taylor polynomials around 0. These approximations converge to the function only in the region −1 < x ≤ 1; outside of this region the higher-degree Taylor polynomials evolve to worse approximations for the function. This is, by far, the fastest converging of the series described here. where C is an arbitrary constant of integration. Such techniques were used before calculators, by referring to numerical tables and performing manipulations such as those above. which has cubic convergence to ln(x). gives a high precision value for small values of x on systems that do not implement log1p(x). The computational complexity of computing the natural logarithm (using the arithmetic-geometric mean) is O(M(n) ln n). Here n is the number of digits of precision at which the natural logarithm is to be evaluated and M(n) is the computational complexity of multiplying two n-digit numbers. These continued fractions—particularly the last—converge rapidly for values close to 1. However, the natural logarithms of much larger numbers can easily be computed by repeatedly adding those of smaller numbers, with similarly rapid convergence. The exponential function can be extended to a function which gives a complex number as ex for any arbitrary complex number x; simply use the infinite series with x complex. This exponential function can be inverted to form a complex logarithm that exhibits most of the properties of the ordinary logarithm. There are two difficulties involved: no x has ex = 0; and it turns out that e2πi = 1 = e0. Since the multiplicative property still works for the complex exponential function, ez = ez+2πki, for all complex z and integers k.
So the logarithm cannot be defined for the whole complex plane, and even then it is multi-valued – any complex logarithm can be changed into an "equivalent" logarithm by adding any integer multiple of 2πi at will. The complex logarithm can only be single-valued on the cut plane. For example, ln(i) = πi/2 or 5πi/2 or -3πi/2, etc. ; and although i4 = 1, 4 log(i) can be defined as 2πi, or 10πi or −6πi, and so on. ^ For a similar approach to reduce round-off errors of calculations for certain input values see trigonometric functions like versine, vercosine, coversine, covercosine, haversine, havercosine, hacoversine, hacovercosine, exsecant and excosecant. ^ Burn, R. P. (2001). Alphonse Antonio de Sarasa and Logarithms. Historia Mathematica. pp. 28:1–17. ^ O'Connor, J. J.; Robertson, E. F. (September 2001). "The number e". The MacTutor History of Mathematics archive. Retrieved 2009-02-02. ^ Cajori, Florian (1991). A History of Mathematics (5th ed.). AMS Bookstore. p. 152. ISBN 0-8218-2102-4. ^ Euler, Leonhard (1737). "Variae observationes circa series infinitas". Commentarii academiae scientiarum imperialis Petropolitanae (CASP) (published 1744). 9: 160–188. E72. ^ Euler, Leonhard (1925). Opera Omnia, Series Prima: Opera Mathematica. Quartum Decimum. Teubner. ^ Cauchy, Augustin. Exercices d'analyse et de physique mathématique. 3. p. 380. Retrieved 2015-10-31. ^ Legendre, Adrien-Marie (1798). Essai sur la théorie des nombres. VI. Paris, France: Duprat, libraire pour les mathématiques, quai des Augustins. ^ Landau, Edmund (1953) . Handbuch der Lehre von der Verteilung der Primzahlen (2 ed.). Berlin: Chelsea, New York. ^ Piskounov, Nikolaï (1972). Calcul différentiel et intégral (5 ed.). Moskow: Editions Mir. p. 91. ^ Jolley, L. B. W. (1961). Summation of Series (PDF) (2 (revised) ed.). New York, USA: Dover Publications, Inc. LCCN 61-65274. Retrieved 2015-10-31. ^ Ballew, Pat. "Math Words, and Some Other Words, of Interest". Retrieved 2018-01-18. ^ Sasaki, T.; Kanada, Y. (1982). "Practically fast multiple-precision evaluation of log(x)". Journal of Information Processing. 5 (4): 247–250. Retrieved 2011-03-30. ^ Ahrendt, Timm (1999). "Fast Computations of the Exponential Function". Stacs 99. Lecture Notes in Computer Science. 1564: 302–312. doi:10.1007/3-540-49116-3_28. ISBN 978-3-540-65691-3. ^ a b c d Beebe, Nelson H. F. (2002-07-09). "Computation of expm1 = exp(x)−1" (PDF). 1.00. Salt Lake City, Utah, USA: Department of Mathematics, Center for Scientific Computing, University of Utah. Retrieved 2015-11-02. ^ a b c d HP 48G Series – Advanced User's Reference Manual (AUR) (4 ed.). Hewlett-Packard. December 1994 . HP 00048-90136, 0-88698-01574-2. Retrieved 2015-09-06.